Mail and cargo flights between the Chinese coastal city of <?xml:namespace prefix = st1 ns = "urn:schemas-microsoft-com:office:smarttags" />Yantai, Shandong Province, and Seoul, South Korea, went into operation on Tuesday, shortening delivery times between the two cities by at least 12 hours. A Boeing 737 aircraft of China Postal Airlines, specializing in express mail services (EMS) and cargo transport, took off from Yantai International Airport at 11 a.m. and landed in Seoul 70 minutes later, airline sources said. 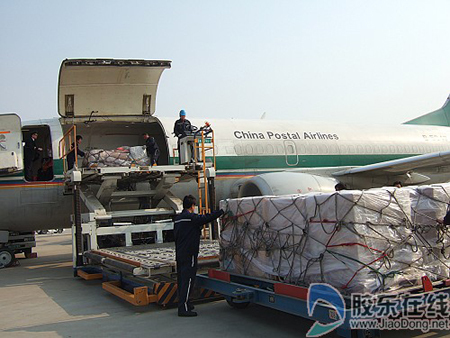 It is the first cargo flight service between South Korea and Shandong, its largest investment destination in China. South Korea has invested about 20 billion US dollars in the eastern province through 2007, accounting for 27 percent of its China investment. The new route boosts economic exchange between Shandong and South Korea and gives China Postal a better footing in the international market, according to the China Postal Airlines source. Currently, there are 18,000 companies that have been directly invested by South Korean businesses in Shandong, half of the total in China. China Postal Airlines will fly from Yantai to Seoul five times weekly, according to company sources. Express mail from the province can arrive at Seoul, Gyeonggi and Incheon in South Korea the next day and in other cities a day after that. Shanghai-based China Postal Airlines, a 51/49 percent joint venture between China's State Post Bureau and China Southern Airlines, boasts a fleet of 13 aircraft and operates 30 flights to a dozen domestic cities. The company's delivery network covers more than 300 Chinese cities. In line with its commitments to the World Trade Organization, China has fully opened its express delivery market. International delivery companies such as DHL, TNT and UPS are now competing in China.